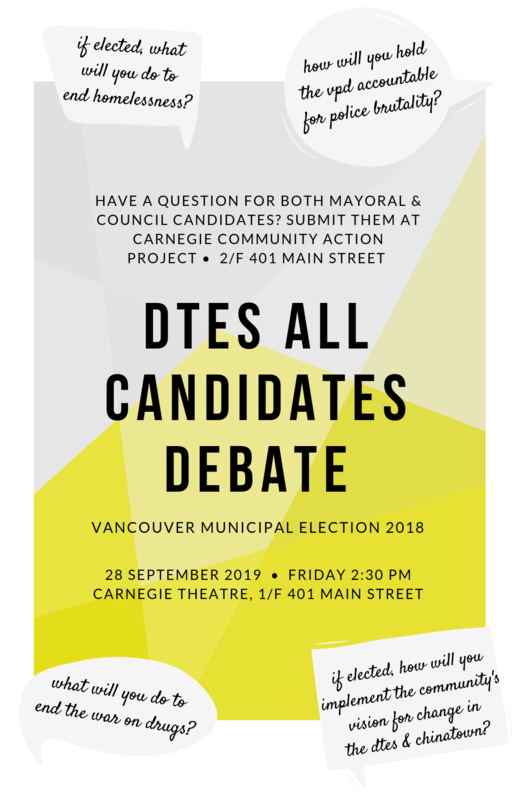 The Carnegie Community Action Project (CCAP) and the Carnegie Community Centre Association (CCCA) are hosting an All-Candidates’ debate this Friday, September 28th. This event will focus on issues facing Vancouver’s Downtown Eastside, Chinatown, and Hogan’s Alley community. If you’d like to submit a question for our committee to review, send us an email at lenee@carnegieaction.org or leave a question in the envelope on the CCAP bulletin board on the second floor of the Carnegie Centre. Please email lenee@carnegieaction.org for questions regarding accessibility. This event and our ongoing work takes place on the occupied and stolen territory of the xʷməθkʷəy̓əm (Musqueam) and səl̓ilwətaɁɬ (Tsleil-Waututh), and the Sḵwx̱wú7mesh Úxwumixw (Squamish) nations. Share the Facebook event page. « We’re Hiring! CCAP Coordinator and Administrator	» 100% welfare/pension rate housing at 58 W Hastings & end renovictions now!